Example of vinegar syndrome in 16mm film print. 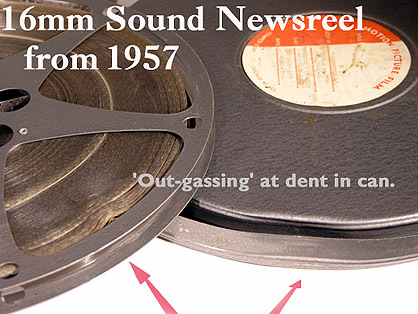 This 16mm sound reel from 1957 shows advanced 'vinegar syndrome,' a breakdown of the safety film base that produces a characteristicly acrid 'vinegar' smell in affected films. A Chicago laboratory processed the film rapidly for showing within a matter of hours after a golf tournament sporting event. Insufficient washing to remove all traces of processing chemicals, in particular fixer, allowed the film base to degrade with 'vinegar syndrome' over years. The newsreel film was in private possession of the featured sportsman over 50 years and was not stored in a film vault with other films, indicating that the vinegar syndrome has developed from the film base itself, not from cross contamination. Incorrect storage in a garage over many years will have hastened deterioration. The dent in the side of the can (arrowed) has allowed the strong fumes from the deteriorating film base to escape, concentrating to distort the film windings at this point. Significantly, this indicates that it is the 'out-gassing' vapours that have accentuated the distortion and warping, not 'inward' fumes from affected films stored together. How To Handle Vinegar Film Prints? Vinegar syndrome comes by degree and may take many years to develop before a film would be unprojectable and ultimately so deteriorated as to lose its images and sound. Isolate any film reel that exhibits signs of vinegar syndrome. Allow the film space to ' breathe ' for a few days in a well ventilated room outside of its original can or cardboard carton. Porous card boxes that have stored a vinegar film should be destroyed. Fibre transit cases and metal cans can safely be reused. Plastic acrylic film transit boxes should be examined closely for signs of contamination, particularly any polythene foam padding should be removed, even if not rotted. Polythene foam 'sweats' and eventualy breaks down into globules of gooey residue. Possibly polythene breakdown will set off vinegar syndrome. Film should be removed from old polythene bags, and grease-proof paper bags used instead. Rubber bands should be removed from contact with film. When rubber perishes it will eventually become dry and brittle and adjacent film coils will have moisture drawn out where the rubber touched. This is particularly so with 50'ft. 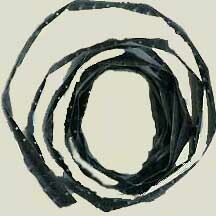 8mm films with rubber bands holding the outer coils. Plastic cans that contain a film with vinegar syndrome may have become very brittle, crumbling like biscuit, because of loss of plasticiser in reaction to holding a vinegar syndrome film. Unfortunately, while the can becomes brittle, the VS fumes from the film stored inside will cause the film edges to absorb the can's plasticiser resulting in a disastrous curling inwards of the film lengthwise. Plastic cans should never be used to store vinegar syndrome film. Once the film has had a chance to aclimatise it can be examined. Download a useful sample Film Report Sheet frps2.pdf here. (Requires Acrobat reader). The form may be used to to enter details of print condition. Is There a Strategy for Vinegar Films? If you have access to a split spools and rewinds the film can be unwound carefully and taken up on a core by very careful hand winding. The inner windings will now be outside and the outer windings now on the inner side. A loose sagging droop of loose coils may form and it is important as you hand wind to avoid causing the loops to pull against and mark the film emulsion or base. Observe for warpage and 'twisting' and make a note of the number of 'twists' across a measured distance. Replace old film leaders and tails with fresh new ones recording the exact information from the old film leaders. Allow the rewound film to aclimatise once again for a day or so, and now wind it back noting the degree of warping as before. Wait once again and repeat the wind/rewind process taking note of any improvement in the degree of film warpage and distortion. In this way a film can be stabilised and improved with any loose wind and any sagging droop gradually taken up as the film coils 'relax' back into their original regular shape. The twist should get less over the measured distance and this will indicate any improvement. Re-spooling a VS film that is on 2,200' ft. reels onto 1,200' ft. reels will lessen shrinkage of the innermost windings at the centre of the reel. The idea is to keep the diameter of the inside coils large to minimise distortion. With common film prints that have become affected, projection and viewing can continue where warpage and deterioration of the base has not progressed so far as to make the perforations shrunken. Regular excursions through a projector for such prints may indeed extend the useful life. An affected print can run perfectly, and, other than the acid smell continue to remain relatively stable over years without the V.S. worsening. The print will not dwell for too long in a can with the wound film coils transposing V.S. each wind to its neighbour through proximity. If the film sags and droops as it fills the take-up reel, then an outsize take-up reel may be used to accomodate the uneven wind. Where the take-up spindle self-adjusts through gravity. As the take-up reel fills it gets heavier. The spindle is designed to increase friction grip on the take-up by increments. A steel take-up reel may be used instead of a lightweight aluminium or plastic one which may cause loose winding. The above details are a strategy for film prints and non-original elements, assuming VS affected films are not unique and that good prints and master materials exist. Camera original negative and reversal master material should have received optimum manufacture of film base and processing (extended washing and rinsing). Vault storage and preservation of these original elements make camera master material less prone to deterioration through VS.
No chemical or film treatment is used for the above methods. There is no cure for Vinegar Syndrome in cine films. Whatever film treatment is applied will simply mask the vinegar smell. These film cleaning solutions will remove surface dirt and residue and lubricate film prints. They can also mask mild base side and emulsion abrasions during projection as the projected light will refract less from abrasions when filled with waxy cleaner residue. However any perceived improvement in a VS film treated with film cleaner will simply be from VS film being wound back and forth during application and should not be attributed to the action of film cleaning agent alone. To conclude; extended re-washing and and rinsing of VS films will work to reduce the VS progression temporarily or over a longer period. Rewashing to the ammoniated formula well-known in past Kodak Data sheets is effective to inhibit further distortion and retard warping and will extend the time that film prints are projectable. This is especially so if the print is rewashed before the inner coils begin to warp and shrink. The airing and rewinding strategy described above needs to be repeated as a regular continuing regime with rewashed films whose vinegar smell will appear to have gone after an ammoniated extended rinsing. You may expect five or more years before the syndrome returns and, after seven years, warping and vinegar will return. Ammoniated rewashing of films with begining, mild, vinegar syndrome, without warping, may extend more years before advanced v/s returns. These comments refer to rewashing of an advanced v/s film print whose v/s characteristics appeared to marvelously disappear after ammoniated extended rewashing in 2009, but have returned by 2018. Ultimately, the final stage of vinegar syndrome is complete crystalisation and decomposition of the film base. This will produce detachment of the gelatin emulsion 'pellicule' from the shrunken base known as 'bubbling.' A white powdery or soapy deposit of acetic acid will form between the emulsion and base layers due to the plasticiser of the film base drying out. This crystaline decomposition of the base can produce the creeping growth of fern-like crystaline artifacts of myriad shapes. This is described as 'channeling' and 'orange peel pattern.' Vinegar syndrome films inside cans undisturbed for many years, when unwound from the reel, will curl up and buckle once released from their coils and free to the atmosphere. With still film negatives of single pictures in this condition it is possible to remove the pellicule from the film base and preserve the emulsion image separated from the base. With cine film, the perforations on the film base are essential to registration of the many thousands of separate pictures that make the moving image. Detatched from the base, the delicate gelatin emulsion pellicule can be preserved in still picture form. VS is also found in magnetic coated perforated film sound tracks causing warping and distortion and shedding of the oxide coating. Audio tracks on perforated film can be treated and transfered to non acetate base or other digital media sound files. Please enquire.